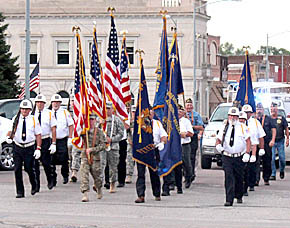 With a parade and ceremonies last Wednesday evening, Sept. 11, Boone County residents paid tribute to Americans who died in terrorist attacks on Sept. 11, 2001, and also those who have protected America’s freedoms since that date. About 150 area residents participated. “Nine-11 was the biggest act of terrorism ever on U.S. soil,” said guest speaker Dale Bruckner of Platte Center, NE, commander of the American Legion Department of Nebraska. “Today, we pray for those victims and their families, and we pay homage to those brave American men and women who now protect us from terrorism around the world,” continued Bruckner.